Officer Craig Lehner's casket being brought to its final resting place at Forest Lawn Cemetery. Investigative Post reviewed more than 130 pages of police documents obtained through state Freedom of Information Law and interviewed half-dozen diving experts across the country. Those experts did not want to talk about the incident itself. But the practices they described for public safety diving teams elsewhere differ from what’s done here in Buffalo. Police officials declined to comment. Lehner first learned to dive when he received an advanced scuba certification in the clear Caribbean waters off Guantanamo Bay in 2014 while serving the National Guard. He later joined the Underwater Recovery Team and trained five times in the relatively calm waters of the Buffalo River and Union Ship Canal. Those experiences are worlds apart from the swift and debris-laden waters of the Niagara River where he took his fatal dive. 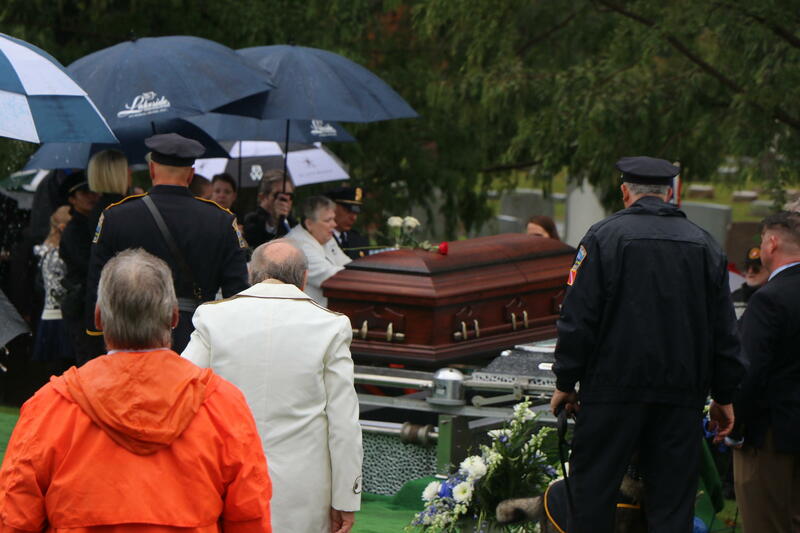 Lehner's mother saying goodbye to her son at his burial at Forest Lawn Cemetery. David Concannon, an attorney who investigates diving fatalities, questioned why Lehner was put in such a dangerous environment for a training exercise. Click here to read the full story from Investigative Post.